Northern Nevada, the home of the little big city and the Sierra mountains; it is a wonderful place to live, work and visit. Fancy Flush is based in the Reno, Nevada area; servicing the major cities listed below. If you do not see your city listed but want to see if we can still drop off in your area please inquire on our contact page or give us a call. Fancy Flush is not just another porta potty company. We operate more like an event and equipment rental company. Instead of having hundreds of clients on one weekend, we only have a dozen maximum; this allows us to give our full attention and detail to every delivery. 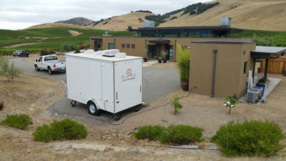 We provide luxury restroom trailers for weddings, parties, business openings and much more. 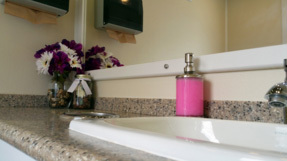 Our restroom trailers offer your guests an upscale alternative to a portable toilet that will be one of the highlights of your event. 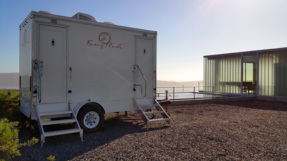 Fancy Flush's restroom trailers are robust and easy to use. Our staff passionate perfectionists whose aim is your complete satisfaction. Create lasting memories and make your special event even more special with our luxurious portable restroom trailers.